Apple season in Michigan comes with a slate of sights and tastes all its own, but it's not just about the apples. 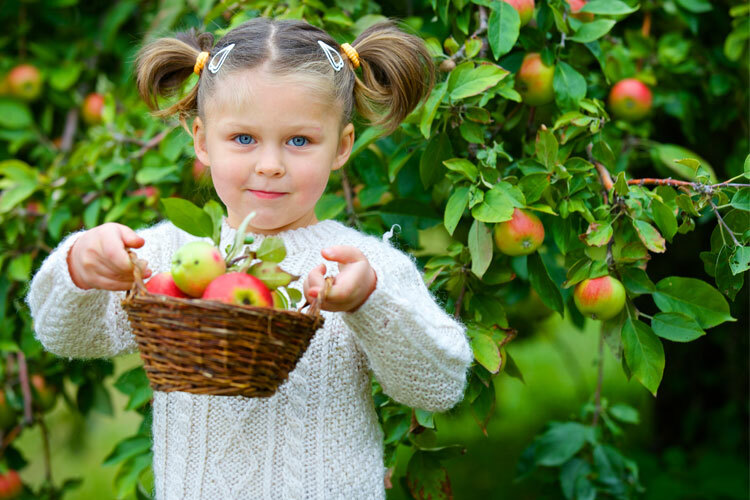 Sometimes, it's about the experience of going out and picking just the right apple. So, when you're hungry for a sweet chunk of Michigan in a little red ball, put on some good walking shoes and check out one of these great Michigan U-Pick apple orchards! Corey Lake Orchards in Three Rivers offers apples when they're in season, and sometimes at unexpected seasons. Jersey Mac and Lodi apples, for example, are in season earlier than the standard Red Delicious out there, and there are a wide variety of choices throughout portions of the year. While there, check out the bakery displays, the wine and brandy operations, and the apple cider options in season for a complete apple—and other fruit—experience. A.W. Overhiser Orchards makes its home in South Haven, one of the great tourism and beach destinations Michigan has to offer. Offering apples in abundance, but also cherries, peaches, plums and pumpkins as the seasons allow, this orchard will have plenty of fruit ready to take home. While you're there, though, consider checking out the bakery options, and a hands-on animal barn to introduce the kids to the animals they may have only read about or eaten previously. Fennville's Crane Orchards is home to apples on a pretty substantial scale. With 13 different varieties of apple on hand, along with blueberry bushes, pumpkins, several gourds and more, you'll have plenty of u-pick fruits on hand to sample throughout the year. The farm itself even has an unusual backstory—how many farms do you know of that were shaped by hand using a combination of bulldozers and dynamite? The Husted's Farm Market and Cider Mill in Kalamazoo's season starts early with the arrival of Michigan asparagus, generally the first Michigan crop available. From there, it carries on into rhubarb, strawberries, cherries, blueberries, peaches, and finally, apples. That's just the pickable options, of course, as Husted's goes into a variety of other options like bakery items, homemade salsa, and plenty more beyond there. Head out to Hartford to check out Big Dan's U-Pick 'em, where there are plenty of fruits available for your eager, grasping hands. Start with around 16 separate varieties of apples, and then carry on from there. Take some of those apples and coat them in caramel, and that's one more option. You can even have them crushed into cider. Just to top it off, you'll be able to get in on pumpkins and hayrides to round out the experience and make it not just a quick stop for fresh seasonal groceries but a complete day out. Spicer Orchards in Fenton opens up an absolutely staggering range of fruits available to be picked. From blueberries to raspberries to peaches, cherries and of course apples, you'll be able to have fresh fruit through just about the entire fresh fruit season in Michigan, which is surprisingly lengthy. There's plenty else on hand here, though, including bakery options, fudge, jams and jellies, and of course, cider and wine to round out the menu. More commonly known as “Westview Orchards,” Romeo's Westview Orchards & Adventure Farm takes the notion of adding side attractions to a whole new level. At this location, you'll find events like live music, yoga, and trivia nights. It's actually sufficiently built up that it sells season tickets. Westview Orchards will offer apples for picking in several different varieties, but those who want to pick strawberries, peaches, or even pumpkins will have a place at this table. Southwest lower Michigan is commonly regarded as prime real estate for fruit growers. Jollay Orchards in Coloma takes full advantage of this fact to produce a wide variety of fruits, many of which can be picked directly by the consumer. Apples, naturally, are front and center, but so too are both sweet and tart cherries, peaches, and pumpkins “in every imaginable size.” Plus, in the fall—when the apples are coming on anyway—check out the annual Harvest Festival that features a haunted house, pond fishing, corn maze and more. Billed as “not your average fruit stand,” Friske's Farm Market in Ellsworth makes it a point to offer up a lot more than the average fruit stand might. Of course, it's got what the fruit stands do, like fruit available in a host of varieties. Bakery goods and even complete meals are on hand with pizzas and a complete cafe option. There's even a complete outdoor playground for the kids. After all that, the apple picking might seem like an afterthought, but there's plenty of apples available in the orchard, so come for absolutely everything else, and leave with the produce of fresh-picked apples in hand.